Illustration: Jim Cooke/GMG. Screenshot: YouTube. 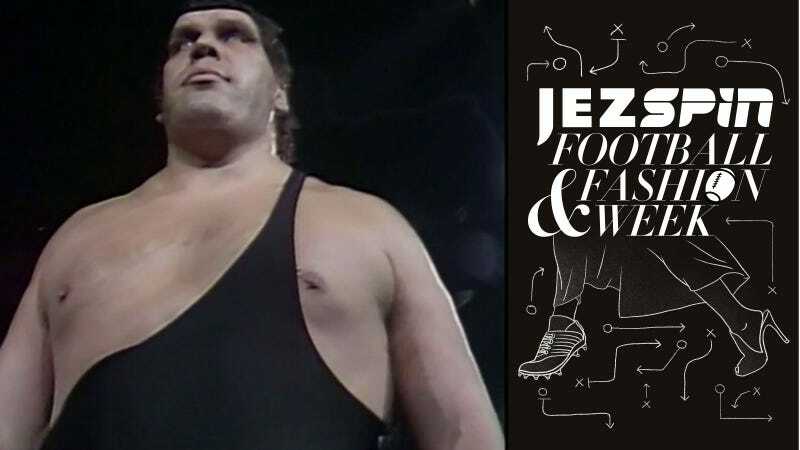 Andre the Giant was billed at 7-foot-4 and 520 pounds. He was huge, and he was great. He was reportedly a good guy in real life, too. He even has one of the great pro wrestler crossover roles, as Fezzik in The Princess Bride. He is a legendary human. But you don’t want to dress like him. I don’t mean his frilly dress shirts and 1970s-style blazers, though you may want to avoid those as well. What I mean is you shouldn’t wear a top that makes it look like you’re in Andre the Giant’s wrestling tights. You know this one-shoulder top. It’s on trend every once in a while, including now. It comes in a variety of styles and colors, but they all share this: There’s only one shoulder on it. Sometimes the one shoulder is actually a full sleeve, sometimes it’s frilly, sometimes it’s a big shoulder strap, sometimes it’s a small shoulder strap. This can be sure. But you should not get this top in black. Because if you do, no matter how it’s styled, you will look like Andre the Giant. If you wear a pink and black dress with a leather jacket you don’t really look like Bret “Hitman” Hart. But if you wear a black one-shoulder top, you look like Andre the Giant. It’s unavoidable. I don’t know why it does. Pro wrestlers have styled themselves in any number of outfits. If you wear a pink and black dress with a leather jacket you don’t really look like Bret “Hitman” Hart. If you wear a black t-shirt and jeans you don’t look like every wrestler from the late 1990s. But if you wear a black one-shoulder top, you look like Andre the Giant. It’s unavoidable. Look, I am merely the bearer and not the instigator. If you want to blame anyone, blame WWF owner Vince McMahon. Andre was in those black, one-shoulder wrestling trunks during his most famous run in the 1980s—main eventing WrestleMania III against some guy, later winning the WWF title, et cetera—and that is the lasting image of him that endures 25 years after his death. His black, one-shoulder wrestling top. The first time I really noticed one-shoulder tops was on senior week. We were standing on the boardwalk and five girls walked by at the same time, all wearing black one-shoulder tops. It looked like a parade of Andre the Giants. In college I did mention it to a friend once; she reported to me the following day that she’d thrown out all her black one-shoulder tops because she didn’t want to look like a pro wrestler. I am sorry for waiting 18 years since that senior week moment to tell the world. So this is a warning: Please don’t wear a black one-shoulder top. Unless, of course, you’re trying to look like Andre the Giant. In that case, please go ahead.